On Tuesday, February 23, 2010, I met with Wendy Olsoff at her gallery, P.P.O.W., in Chelsea, and she told me about starting her gallery 27 years ago, about idealism, sellable art, the death of feminist art, and our need for a woman president… amongst other things. Anna Ogier-Bloomer: How did you get started in this business? You’ve been doing this for over 25 years. Wendy Olsoff: Yes, we opened in 1983. I was working in a gallery before. I went to college as an an English major, actually. Then I moved to New York City and worked in retail and hated it. I wanted to do something else and a friend said, ‘Why don’t you work in a gallery?’ I didn’t really know anything about galleries. I thought about what he said and thought it might be a good idea to meld my interests in art and retail. Eventually I got a job in Soho in a little gallery on the ground floor on West Broadway. What was your mission as a gallery when you started, and what is it now? Was feminism ever explicitly a part of that? 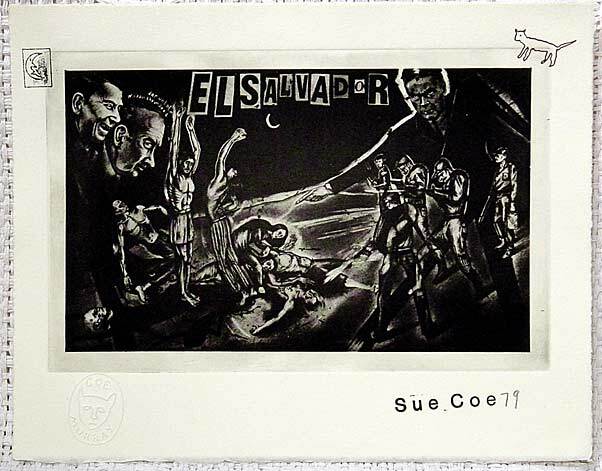 Sue Coe, El Salvador, 1984, photo-etching on paper plate: 5 3/4 x 8 7/8 in. Image courtesy Smithsonian Museum website. Our first show was Sue Coe, which was phenomenal because she’s fantastic. We, about a year before that, had heard of her and met her because there was this thing in New York called ‘Britain Salutes New York.’ There was a show of young artists in Staten Island that a curator said, ‘Come and see the show; I did a show of the real Britain.’ It was a very political show. We loved Sue Coe’s work and we said, we have to find that woman. We opened in the fall and had a little group show, and then we opened Sue Coe. She was technically our first show and it was a big hit. And the East Village was so trendy that the limousines and the collectors and the press just rolled up. We opened with a bigger opening than anything I had seen in the gallery on the Upper East Side, and we sold the show out and got reviewed in Art Forum. We were immediately on the map in the East Village. We were in the first ten galleries to open in there, and in the next year or two, there were up to probably 60 galleries there. We were really one of the originating, and we were very much a part of the scene down there. So when did politics and feminism start to be important to you? Do you identify that as part of your mission now, or do you see it more as just an interest? Politics were always important. Sue Coe was our first artist, and the reason we gravitated toward Sue was because at the time, the work they were showing in Soho was extremely apolitical and boring to us. You have to imagine, 25 years ago, political art was not shown. Art about ethnicity was not shown. Feminist art—these words were not part of the vocabulary at all, and no one was really doing it. There are always exceptions, of course, but it wasn’t like it is now. We were taking on Sue and our identity was pretty much sealed early on. We’ve pretty much stuck to it always. Although there have definitely been many little roads and journeys we’ve taken outside of it, politics and political art have always been at the heart of our program. Still, many artists we show are not political. That’s just how it is. But there is always an interest in it. Sue was very influential, but we’ve shown such phenomenal people since. We showed Carrie Mae Weems before she was well known, we’ve shown Nancy Spero, we show Carolee [Schneemann], Julie Heffernan. 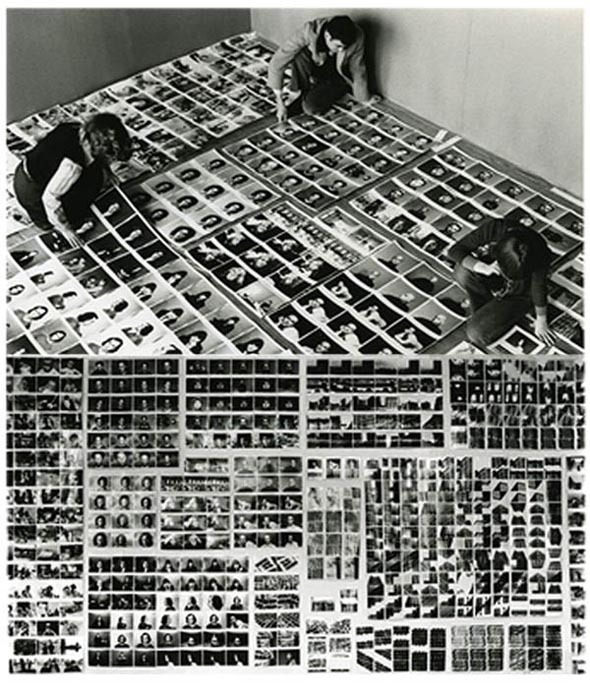 We show many women artists and political artists as well, like David Wojnarowicz, and Dinh [Q. Le], whose show is up now. But it was a never a manifesto or anything written down. If you look back at our mission statement, it was just to show contemporary art in all media, like we showed photography before people showed photography. We never really specialized like that. We always think of ourselves as showing narrative, figurative work. But we never openly say we’re a political art gallery because there are so many artists we show that aren’t political. You have such an amazing roster of people. I love that it’s political work and it’s also stuff that’s not overtly political. I think it’s a great mix. I wonder if that’s because of the time, maybe people were turning inward and sort of feeling more introspective. Maybe trying to make things to sell was the goal. Now I think you’re finding people realizing it’s going to be really hard to sell so what the hell. 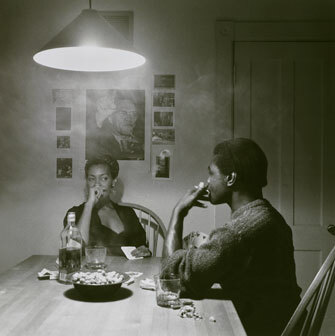 But really it was the right time in the right place, because people like Sue Coe, Carrie Mae Weems, Nancy Spero, and Carolee–they’re not ordinary artists who are just going to keep coming along. In terms of making a feminist agenda—I was thinking about it recently in fact… I was a teenager in the 60s and 70s, so feminism was bra burning and Gloria Steinem on TV and The Dinner Party, which I remember seeing as a kid. I was caught between a very traditional 50s mother who totally gave up her life like so many other women who had totally mastered the mop and cleaning the sheets and was totally unhappy, and also having a TV broadcasting all the great things women were doing constantly in the backgroud. I don’t think I ever really understand that until recently—how much early feminism played a part in my personal suburban upbringing—because it was so not taught to me by my mother or my school or anything I read. It was never clearly articulated. I think now for girls it’s articulated. If you look at the timeline the Sackler Center [for Feminist Art at The Brooklyn Museum] has on their website of the feminist movement, it’s like—now—boom—all these shows. In the 90s it seems like there were more things to do, more shows being done, more books being printed, so it’s unavoidable in a mass media way, and everybody has to see it, whereas before, you were labeled a feminist and it was sort of an insult if you kept it a secret. Now it seems more like a strong badge or a positive label… it is a different time. 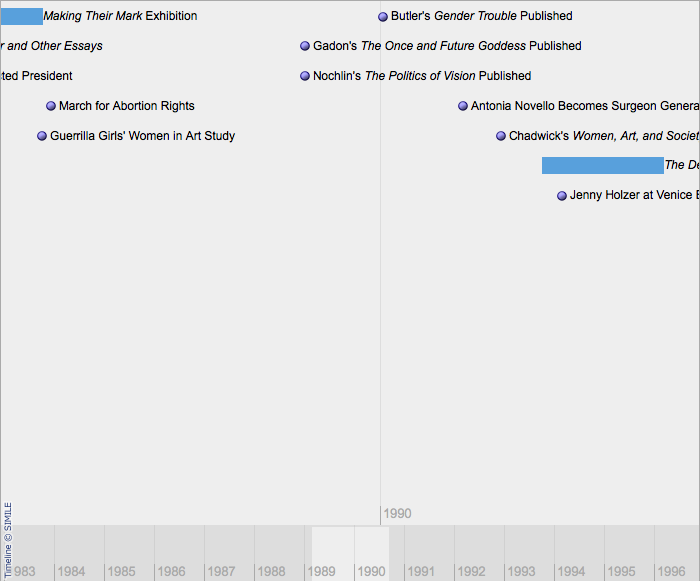 screenshot of Sackler Center's Feminist Timeline U.S. Does it feel like it’s more mainstreamed now? Does it feel like that shift occurred in the 90s? Yeah, more mainstreamed. No, I think it started actually in the late 90s. I think it’s worth looking at the timeline at the Sackler Center. If you look at how spotty it is all through the 60s, 70s, 80s, and all of sudden now, there are dozens of shows out and so many books being published. I am sure at universities and all over, the corner turned so that feminism isn’t a scary word anymore. We even get movie stars saying they’re feminists even if they’re not. Men are embracing the word feminist–it doesn’t scare them…it just doesn’t scare people as much, that’s what I think. I could be wrong and I could have a warped perspective…but I think a shift has occurred. But in terms of the gallery, it wasn’t as if we ever saw ourselves as a feminist gallery. We were always a more political gallery. However, we got an award from A.I.R. Gallery for women in the arts, and I was really happy that they did that because it made me think there was recognition for what we stood for. Over the years I didn’t come to any brilliant conclusion or defining moment where we said “let’s be a feminist art gallery”, but I choose art that I like and it happens to be made by women. It is not something we do on purpose. If two people come in here and show us work, I tend to like what the woman is doing more – I relate more to the content. I don’t know why, because I’m never making a choice based on gender; it’s just based on the work. So I’m never picking work because it’s a woman who made it. Being recognized was important for me – like being celebrated for an integral part of myself that I didn’t choose to exploit…. But you just found that your tastes tend towards women artists? Yes, exactly. My tastes go that way, but I think it’s just because they’re doing more interesting work. I never say, oh, let’s show the man because it might sell better or get better prices, which may be more an agenda of other galleries. Do you think that’s the case in the commercial art world? I don’t think anyone would ever say it. But you think it’s true. Well, it has to be true because men make more money and galleries are businesses. However, you know maybe that’s changing a little bit because women like Alice Neel and Marlene Dumas have hit higher prices, so maybe the bigger galleries, like Pace and Gagosian, are seeing potential for women to make money. If they are businesspeople, and they are, they’re doing an analysis. Then it’s a slam-dunk that men are going to make more money. So I don’t know how they choose their artists, but why then do they show more men than women? 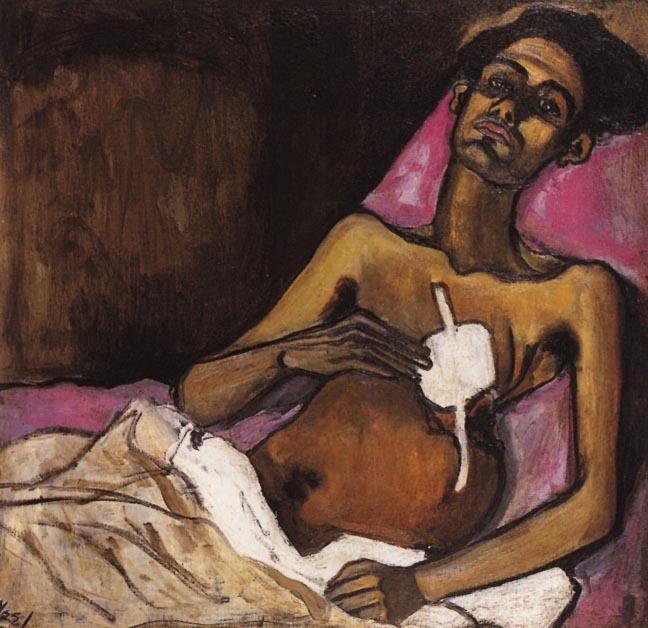 Alice Neel, T.B. Harlem, 1940, Oil on canvas, 30 x 30 in. Image courtesy http://www.nmwa.org. It’s reflected in other industries, too. More women are in school for art, and in school for everything right now, it’s 75% women, and when you look at who’s at the top of this field making money, its about 2% women. So where do they go? Somewhere in between, we lose the women? I don’t know. They go home, to the house and children? I don’t know. Yes, it’s true, I know. Studies have been done in lot of schools, and art schools, and I know that liberal art schools have more women than men in every incoming class. It’s kind of weird now that if you’re a white boy, you have a better chance of getting in than a white girl. Yes, I heard that on NPR, they’re considering doing a form of Affirmative Action for men over women. I’m lucky; my son is 14. My daughter just applied to college and their Dean of Admissions came out and said if we’re looking at two identical people, we’ll take the boy [over the girl]; she just came out and said it, and was very honest about it, and everyone was like, oh my god. There are more girls being rejected. Wow, I wonder where that’s going to take us in the next 10-20 years. Well, reading about it, it’s like, the feminist movement was so successful that now there’s a big rush for girls to get educations and there are too many girls – how crazy is that? How did you come to start doing the events that happened last fall, the panel discussion [Post-feminism: Do We Need To Go There?] and the show with Dotty Attie and the Capricious [magazine] show [Looking Forward, Feeling Backwards, Oct 29-Dec. 5, 2009] at the same time? A year ago January, we had a fire in our space. We had a much smaller space down the block, which we’d been very happy to be in and was a much more traditional space. We had a bad fire and had to move really, really fast. This building had a lot of space for rent because of the recession and offered us a space for great rent to get us in here. And we opened really quickly; we did sort of this heroic thing. So we found ourselves in a traumatic situation with the economy and then we had a fire and we ended up in this big space. We decided to use the opportunity to do more performances and do more events. Jamie Sterns is amazing and she does all that; she programs everything. Dottie Attie is an artist we’ve shown for a really long time. And artist we show named Melanie Bonajo, from Holland, is very tied into Capricious, and Jamie suggested we talk to Sophie [Morner, founder of Capricious]. We’re trying to build a bigger audience, to use the space to bring in more energy. Jamie herself is tied into a much younger group of people and we work really well together. When I hired her, I said I need someone who can go out, and who wants to do stuff because I have two kids, you know; I can’t do it. And it’s a different time in the art world. We like the programming to be innovative and keep growing and growing, and Jamie has done it, we support it. We try to tie programming into shows, but she’s done a lot of performances here on her own. It’s been good for us and good for the artists and good for Jamie, and that’s just how it turned out, because of the fire. Becca Albee, Response Killings, Newspaper and Flowers 2008, archival inkjet print, edition of 7, 12 x 16 inches. Image courtesy P.P.O.W. website. How did you meet Liz Linden and Jen Kennedy who now do the Feminist Reading Group? We met Liz through Suzie Treister. We had a show and there’s a woman, a fantastic woman and artist named Suzanne Treister who lives in England, and Liz is friends with her. When we had the opening maybe a year or two ago, Liz came to a dinner party and said she wanted to do something with us and she ended up on the panel. It was like the network of people who knew each other. I’m on the council of the Sackler Center and Liz is also showing and doing something with them, so it was sort of like this network that brought Liz to us. It was a great event, and I loved the reading group. So, what do you think feminist art is? Is there such a thing? Is all women’s art feminist? How does that work for you in what you’ve seen here? Well you know there’s a New York Times article about a woman artist in her 90s, Carmen Herrera, an abstract artist. Have you seen that? She has been working in obscurity her entire life. She’s been showing lately in museums and does really beautiful paintings that look like reductionist abstract work, and she’s just been discovered. In interviews, she says how she was totally ignored. It’d be really interesting for you to read it because she’s a great example of someone whose work isn’t feminist but who has been totally obscured and pushed over by the male status quo. Her work was important to her and she just kept working and her life trajectory was that she had a husband and followed him around, but she always worked and always made real paintings. Now someone saw some and bought some and put her in a show, and she’s finally selling her work. There’ve been a couple interviews with her and I read one recently because she says, I was totally looked over, no one was paying attention, I was in a few group shows. 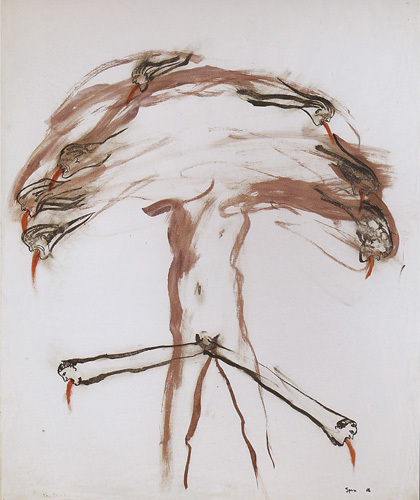 It made me think about Carolee Schneemann and her paintings —if she didn’t do her seminal performance work, her paintings never would have been looked at because, being a woman, the other artists, like Rauschenberg, eclipsed her. Was it because their work was better, or was it because they were men? And then she started doing her feminist performance. And now you can look back at her paintings and they struggle to still be recognized because she’s so identified with that period which was defined by the male practitioners. Now you look at this other woman and she’s a clear case where her work was really beautiful and she was dismissed, because other work made by men was getting attention and getting sold, she was pushed aside. You know, Carolee really tried to stand up and fight the battle, but it didn’t do any good, while Herrera just kept painting in silence. She knew what was going on. So, I guess back to your question, I think there is no longer feminist work, but I think there definitely WAS feminist work. Someone like Carolee or Nancy Spero makes work about feminism or politics and, because of the feminist movement, they’re always going to be important historically. It’s about struggle. But if you discuss power, it is about women as well, it’s just not clearly stated. Carmen Herrera is a feminist by her life choices – her choice to believe in herself and keep working. Her work can now stand shoulder to shoulder with her male peers – she didn’t give the male dominated historians a chance to dismiss her and they cannot do it now – the work is too good and we have come too far. During the panel, someone asked Dotty about her work and whether it was feminist. Dotty’s answer wasn’t clear on that. Yeah, she said she didn’t think it was feminist. 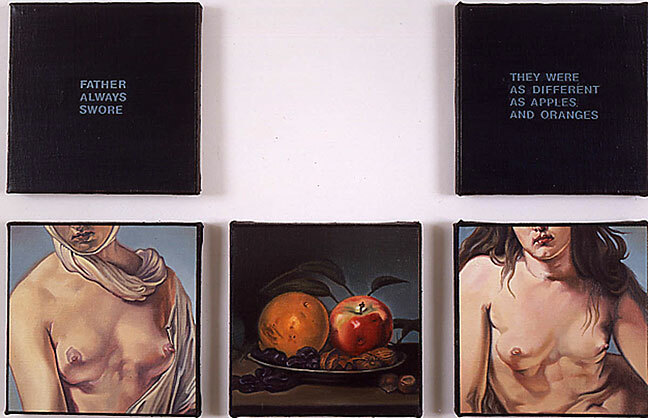 Dotty Attie, Father Always Swore, 1991, oil on linen. Image courtesy P.P.O.W. website. But Dotty’s work clearly is. Dotty’s early work, too, was deconstructing male artists. I think that Dotty didn’t want to be labeled as a feminist and I think that’s where she’s coming from. She has a whole different take on it. Maybe she herself didn’t want that label, even though her work is political and feminist, whether she wants to think it or not. All her work is about taking the male image and changing it; it’s all gender-based. What do you see happening in the near future? Well, now they’re making a big fuss about the biennial having more women in it. That’s good. There are definitely more women curators at all levels and feminist curators as well. Maybe because we have more women in schools there is going to make a difference because you have an incredible amount of really brilliant hard working women now in high places, and that’s going to continue because you have all these young women in schools that are going to be educated and looking for jobs in the arts. And if the women have the freedom to make the decisions they want to make, then things will change. Ironically you have the Whitney Biennial that was curated by men, right? Francesco Bonami and Gary Carrion-Murayari. Someone in the New York Times said this is a ‘‘women’s biennial.” It’s ridiculous, you know? Men picked the work. I have to ask: did the Whitney do this to get attention? The show is not exciting….was it a hook? But it is interesting because we are getting to a point where it’s normal to not exclude women – but it is still far from the norm. The art world is always the first place to move, so maybe the glass ceiling in the corporate world will move too, but who the heck knows. We need a woman president. One point I’d like to expand on is the Whitney Biennial of 2010. It’s been singled out as being the women’s biennial, as Wendy noted, but it’s only 52% women. All this attention for 52% women, just ever-so-slightly more than half? It’s just one more example of how alarming it is when women are the majority of something, anything, but we would never call a biennial that was 52% men (think all biennials) the “men’s biennial.” As Francisco Bonami put it, this is ridiculous; to be a women’s biennial, it would have to be 100% women. Hmm… I wonder when that will happen. It brings up the question of why this happens, how it is that more men get selected to be in shows, to be represented, to sell work for high prices. I’m certainly no expert on this, but I think it must go back to who is active or submitting in the first place. Women are not getting as involved as men, not submitting as much as men, and I think this has to do with the environment that has been created. It’s an environment that is hostile towards women, not hospitable. It’s hard to grow a plant in a desert, and this is similar. In my own experience in career services in higher education, a typically female-dominated field, when hiring a new colleague, we actively tried to interview men, but only one of many, many applicants applied. I think that the change needs to happen from the ground up. It’s tough; do we have a chicken-egg situation on our hands? thanks for the excellent interview content here.